MUNICH — Beckmesser blew his brains out at the end of Die Meistersinger von Nürnberg last night here in the Nationaltheater. That was after first aiming his gun at the back of the head of Sachs, and after a graphically brutal beating by David and bat-wielding apprentices had left him in a wheelchair — a predicament from which he had miraculously recovered, back onto his feet, within the few hours separating Johannisnacht and Johannisfest. Sachs, for his part, never saw the gun; he was sitting moping because Stolzing had ignored his Verachtet mir die Meister nicht, had declined to honor German art or the masters safeguarding it, and had simply walked out with Pogner’s prized daughter. Whether Beckmesser’s character is of the suicidal type is a fair, though in context minor, question. Stage director David Bösch’s new production for Bavarian State Opera offers an altogether transformed view of Wagner’s erstwhile comedy, funded by the same hardworking Bavarian people who brought you the first, on June 21, 1868, when Hans von Bülow occupied GMD Kirill Petrenko’s podium. Swiss-trained Bösch explores the role art can play in society by winding the clock in the opposite direction from the composer. Instead of reaching back three centuries to show the art-guild tradition at its liveliest, when Nuremberg prospered, he forwards us to a faceless town that has seen better days, where the institution feted by Wagner is in yet more jeopardy than when the score was written and where the masters in their trades suffer the effects of debilitating, distant economic forces. Somewhat outside these problems is the presumably flush Stolzing, but even he cannot invigorate through his candidacy a guild whose masters find it easier to delude themselves than honestly confront demise. Sachs’s Wahnmonolog fits right in. Not much else does. The idea of collective depression finds little use for such musical-dramatic particulars as the scent of the Flieder (lilac) or the shade of the Linde (basswood). Bösch has to invert the humor in, for instance, the Nachtwächter’s round and Sachs’s gift to Beckmesser. He defies Wagner’s time-of-day and lighting directives. Indeed, clashes with the composer create an uneasy mix of narrative, pomp, violence and slapstick (song-trial errors marked via shocks to the applicant in an electric chair; a town-clerk serenade from atop a scissor-lift, constantly raised and lowered by the cobbler). But Bösch’s own visual-stylistic trademarks are firmly in place, reminding us of his spacy, zoned-out previous work for this company: L’elisir d’amore (2009), Mitridate, rè di Ponto (2011), and, his touching flower-power effort, La favola d’Orfeo (2014). Neatly arranged decay, locally lit props, black limbo backgrounds, a funky insouciance to the stage action: these are some. 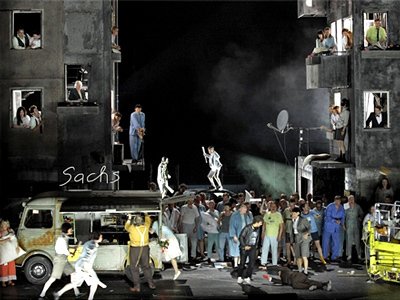 The Bavarian State Opera Chorus sang magnificently for this premiere, achieving levels of expressive detail and shading it reserves for its obsessive GMD; Sören Eckhoff did the coaching. Sara Jakubiak from Bay City, MI, made a welcome debut as Eva, acting well and producing girlish tones in mostly clear German. Benjamin Bruns coped sweetly with the boisterous lyric challenges of David. Jonas Kaufmann added the quality of heroic delivery to the youthful ardor and Lied skills evident in his Scottish Stolzing of long ago. Wolfgang Koch, vocally opulent, looked sloppy as Sachs but conveyed enlightenment anyway. He projected his words impeccably and never forced for volume. Markus Eiche’s musically ideal Beckmesser deserved and received the loudest applause, after tough toiling in Bösch’s action. Christof Fischesser intoned nobly and richly through Pogner’s wide vocal range, while the Nachtwächter’s chant seemed all too short as securely phrased by Tareq Nazmi. Petrenko drew playing of color and sparkle from his Bavarian State Orchestra, favoring momentum (78’ 58’ 70’ 42’) over reflection but pointing the rhythms with ceaseless energy and emphasis, much to the opera’s advantage. Die Meistersinger von Nürnberg will be streamed as video over the Internet at 5 p.m., Munich time, on July 31, 2016, under sponsorship from Linde. This entry was posted on Tuesday, May 17th, 2016 at 4:17 pm	and is filed under Munich Times. You can follow any responses to this entry through the RSS 2.0 feed. Both comments and pings are currently closed.